Nokia always had a reputation for building well-made, affordable handsets that appeal to the hundreds of millions around the world who can’t afford full-fat smartphones — and Microsoft is apparently keen to continue that legacy. Eight months after buying Nokia, the US company has launched the new Nokia 215. It costs just $29 pre-tax and is aimed at emerging markets, offering customers 29 days of battery life on standby, a dual-SIM option, a built-in torch, and FM Radio. There's also a 2.4-inch, 320 x 240 display, a 0.3-megapixel camera, and Bluetooth connectivity. Crucially, however, Microsoft say the 215 is their "most affordable Internet-ready entry-level phone yet," offering the Opera Mini mobile browser and a limited array of pre-installed apps including Twitter, Facebook, Messenger, and Bing Search. The Nokia 215 won’t be the speediest browsing experience around as it only supports 2G networks. However, as mobile markets in Asia, Africa, and the Middle East continue to develop, consumers will get hungrier for more advanced devices and the 215 is another neat, intermediary phone. 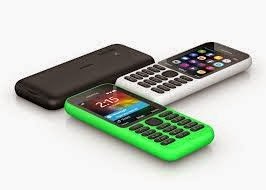 Stephen Elop has previously talked about Nokia mobiles as a "feeder system for Lumia," and although he was referring to the now-defunct Nokia X range, Microsoft execs may well still consider internet-connected feature phones as an on-ramp to Windows Phone itself. The 215 will be launching in select markets in the Middle East, Africa, Asia and Europe later this quarter, but there's no plans to launch it in the US.